As a Maine wedding officiant, my work goes far beyond simply overseeing a couple as they exchange vows. I am a Maine Notary Public. People often refer to me as a Justice of the Peace, or “JP”, but the title is a misconception. In the 1980’s, the State of Maine transferred the duties of Justices of the Peace over to Notaries Public. This transfer is what allows Maine Notaries to perform wedding ceremonies when in most states, Notaries are not given this authority. First, let’s be clear about the distinction between marriages, commitment ceremonies and elopements, as a Maine wedding officiant is frequently called upon to provide all of these services. A Maine marriage is an official and legal ceremony conducted after two people (regardless of gender) have obtained a Maine marriage license. The union of marriage can only be dissolved through the court or by the death of one partner. Elopements fall within the category of Maine marriages. 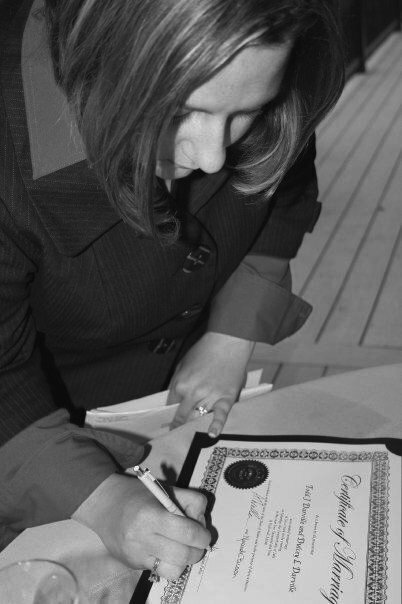 A commitment ceremony is not legally binding. No marriage license is obtained. It is a verbal promise between two individuals but is not recognized by any governmental entity. Vow renewals fall within the category of commitment ceremonies. A straightforward article from the International Association of Professional Wedding Officiants on why couples should never rely on a friend or relative to officiate their ceremony. Fabulous inspiration focused on Maine weddings only. Have a looksie!